A former official at the United Nations and professor of international law slammed the UN and certain Western governments for their support for the Saudi regime’s war on Yemen that has led to a deteriorating humanitarian crisis in the impoverished country. 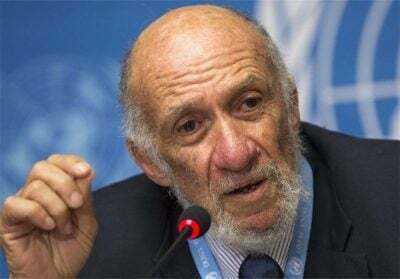 “The situation in Yemen has been scandalously allowed by the United Nations and the West generally to become a major humanitarian emergency where the realities of famine and disease are affecting the lives of millions,” Richard A. Falk said in an interview with the Tasnim News Agency. Tasnim: What do you think about the ongoing human tragedy in Yemen caused by the Saudi blockades on the country’s ports and airspace? The Red Cross has warned that cholera, a diarrheal disease that has been eradicated in most developed countries, could infect a million people in Yemen by the end of the year, according to media reports. The outbreak “has reached colossal proportions,” said Robert Mardini, the International Committee of the Red Cross’s Near and Middle East director. Why have international organizations, particularly the UN, remained passive in the face of the ongoing Saudi atrocities? Falk: The situation in Yemen has been scandalously allowed by the United Nations and the West generally to become a major humanitarian emergency where the realities of famine and disease are affecting the lives of millions. It is a moral and legal failure that is linked to the Saudi intervention, which has been permitted by the UN to continue for several years without any significant pushback. If we wonder why this is happening, the answer, as usual in such situations, is that the prevailing geopolitical forces in the region have treated the war in Yemen as a sectarian battleground, or more accurately, as an intervention designed to defeat the Houthi political challenge, which is regarded by Riyadh, supported by Israel and the United States, as endangering an extension of Iranian influence in a country situated geographically close to Saudi Arabia, and hence politically unacceptable regardless of the massive human suffering involved. Tasnim: As you may know, airstrikes by the Saudi-led coalition have killed mostly Yemeni civilians, including thousands of women and children. A recent report authored by several international aid agencies said Yemen suffered more airstrikes in the first half of this year than in the whole of 2016, increasing the number of civilian deaths and forcing more people to flee their homes. In your opinion, why has the Saudi regime decided to increase the airstrikes, hitting civilian targets? Falk: I cannot usefully speculate about Saudi motivations, although in these cases of airstrikes against essentially civilian targets, the explanation tends to be connected with the inability to prevail in the conflict on the ground by legally acceptable conventional tactics, which rely on attacks directed to the extent possible at the military capabilities of an adversary. A secondary motivation in a conflict of this character is to depend almost solely on air power because it minimizes casualties on the aggressor side while maximizing them on the side of the society experiencing the intervention. Increasingly, when intervention takes place to alter an internal balance of forces it engages in a war against the people rather than risk challenging the military capabilities of the political actor that can best lay claim to representing the nation, and genuine nationalist tendencies, which is the situation in Yemen. From one perspective, it makes sense to direct military vengeance against the people of a society in these circumstances, because only by their demoralization can such intervention succeed. In this eventuality, the intervention has genocidal properties, seeking to kill and maim innocent civilians on an indiscriminate basis, or more accurately, as an unlawful and immoral target. Tasnim: Newly-leaked emails written by two former top US officials have shown that Saudi Arabia’s crown prince and defense minister Mohammed bin Salman “wants out” of the war he started in Yemen. The Saudi regime has reached none of its objectives in Yemen. In 2015, the kingdom had a record budget deficit of almost $100 billion, prompting it to rein in public spending in a bid to save money. Why is the regime continuing its attacks on the Arabian Peninsula country despite its failures and cash-strapped economy? What do you think about the future of the war? Falk: Again, it is difficult to speculate on the current behavior of Saudi Arabia, and the main architect of the Yemen intervention, Saudi Crown Prince and Minister of Defense Mohammed bin Salman, but undoubtedly, the frustration experienced by a failed and costly intervention is in tension with his humiliation that would follow from acknowledging the failure of this undertaking given the scale of the devastation, and suffering caused to Yemen, which even prior to the intervention and civil strife was known to be the poorest and most materially stressed country in the region. The Yemen policy has already done major damage to the international standing and reputation of Saudi Arabia, and its admission of failure would underscore this assessment. Countries often continue failed interventions long after they have become a lost cause because political leaders are persuaded by members of their political entourage at home that the war can still be won and that admitting defeat will be a serious and unacceptable political setback. In such situations, the political leadership of the intervening country searches long and hard for an exit strategy that will hide the reality of an adverse outcome of the struggle, which makes the destruction and loss of life seem to have been without purpose. The United States continued the war in Vietnam (1962-1975) under similar conditions, realizing that it had been politically defeated, but continuing to cause much suffering to the population of Vietnam because it wanted above all to hide the reality of political defeat. These kinds of geopolitical interventions have increasingly failed when confronted by mobilized nationalist resistance as was the case in Vietnam. The situation in Yemen is complicated internally, but the Saudi intervention is the latest tragic example of geopolitics gone wrong and has contributed to the wider turmoil in the Middle East. This turmoil is itself the legacy of a century of colonial and hegemonic ambition, with Britain and France acting as colonial powers between 1918 and 1945 or so and the United States, and to some extent, the Soviet Union gradually displacing the European powers during the Cold War. Since the end of the Cold War, the Middle East has been a major battleground in the struggle to continue Western hegemony, as well as to satisfy Israeli regional ambitions. This effort has focused on containing the spread of Iranian and Russian influence. The peoples of the region have paid and are paying a terrible price in bloodshed and repressive governments for such an undertaking to reestablish hegemonic control over the Middle East by a toxic combination of external intervention and internal collaboration. This latter collaboration closely connects the United States’ global hegemonic goals with the regional policies of Saudi Arabia and Israel.